Soda bread has quite a sweet taste and will not last as long as bread made with yeast. It is better eaten on the same day as it is made but is also delicious toasted: perfect for breakfast the following day. 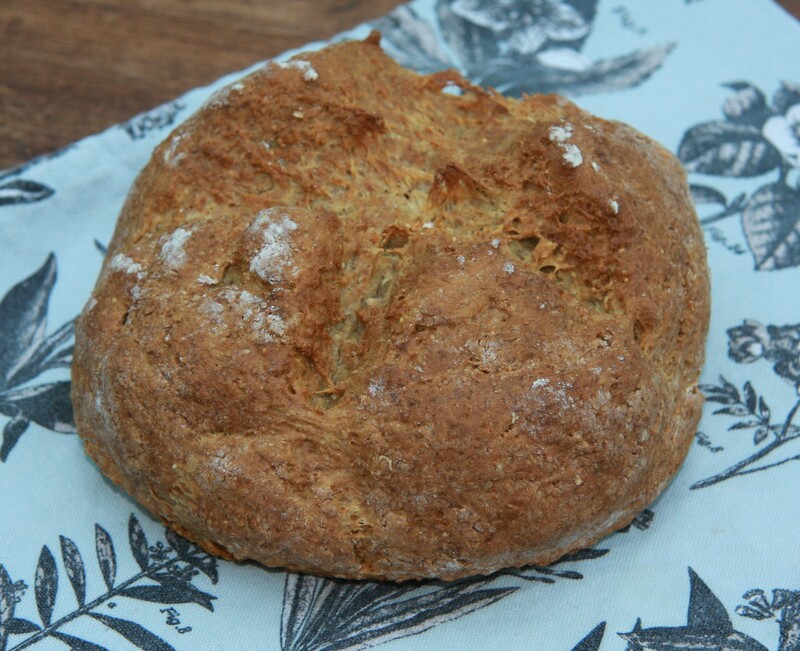 I made this soda bread with spelt flour; a combination of wholemeal and white. It’s just a question of weighing the ingredients into a bowl, mixing, forming into a ball and baking in the oven for about half an hour. You’ll be lucky if it’s cold before you have finished it. I made a small loaf but if you want a larger one just double the ingredients and increase the baking time to 40-45 minutes. Set the oven to 200ºC. Put all the dry ingredients into a mixing bowl. Add the crème fraîche or yogurt and milk and mix together. Knead briefly to form a ball, place on a floured tray and score a deep cross. Bake for around 30 minutes, until well browned and the base sounds hollow when tapped. Transfer to a cooling rack to cool. Particularly good with soup, cheese or jam, and great for hungry brothers. Yum! My friend makes Irish soda bread and it’s great! This sounds great too! This sounds amazing! I’ve been lamenting the death of two sourdough starters over the past few months. This cold weather just doesn’t allow it to thrive, despite much care and feeding! 😦 I might try this soda bread recipe as a quick way to get fresh hot bread from oven to table. It looks delicious, and I adore spelt flour! Thanks lovely! Sorry about your sourdough starters, they seem like they need a lot of care and attention plus a bit of luck! Hope you like the soda bread.